*Materials. Laminates range from a veneer of real wood to a picture of wood applied to a base. Direct-pressure laminate (DPL) is made in one step joining all layers at the same time. High-pressure laminate (HPL) is made in two steps where the print film and backing papers are glued together first. It’s more expensive but has better impact resistance. *Wear ratings. The Abrasion Classification (AC) scale runs from 1 for moderate traffic to 5 for commercial traffic, and measures resistance to abrasion, impact, stains, cigarette burns, and marring from furniture legs and castors. You don’t need AC 4 or 5 meant for offices and stores. AC 3 should be fine in high-traffic halls and kitchens, and AC 2 for most other rooms. *Connection systems. Glued joints are the most water resistant but also the most difficult to install. Some manufacturers help by supplying preglued joints activated by wet wiping just before installation. But you may need to rent or buy ratchet straps- specialized tools that force the joints closed. Click-together joints are better for most DIYers- and pretty much mistake proof because you don’t need nails, glue, or special tools. These six tips will help with your project. Finish everything else on a renovation job before laying the floor. No more sanding or painting that could mar the prefinished surface. Order with enough lead time to store unpacked boards in the work area for a few days. That avoids swelling or shrinking after the installation is done. Install a pad. Manufacturers offer many types, for instance, to provide cushioning, resist moisture, even to reduce sound transmission from a room below. Pull the baseboards, install the laminate with an expansion gap, then cover the gap and the board edges by replacing the trim when you’re done. Plan a random pattern of staggered joints. Use different stock lengths from the packs of boards to start rows, and don’t align seams for at least three rows. Avoid the tedious job of pulling door jambs by using an oscillating tool to trim just enough at the base to slide the laminate underneath. 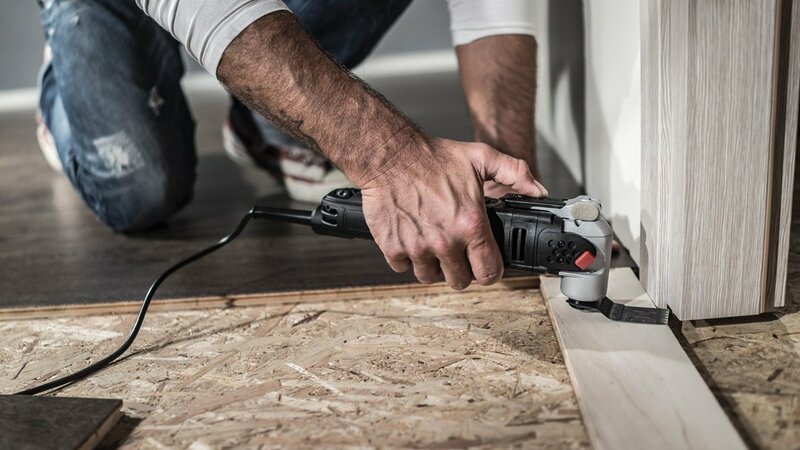 Click-together boards with staggered joints cover a moisture-resistant pad. Replacing baseboards will hide the expansion gaps and laminate edges. I don’t remove baseboards to avoid scaring & time involved but use shoe mould or qtr round stained/painted to match to cover the expansion gap.